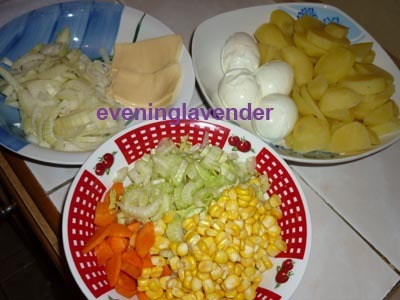 Today, I want to share with you a very simple and fast recipe of a low fat potato salad that I created some time ago. I have tried this recipe a few times and have them tested by friends and family. All of them love the taste, hence I am sharing with you. Hopefully, you would try it out. 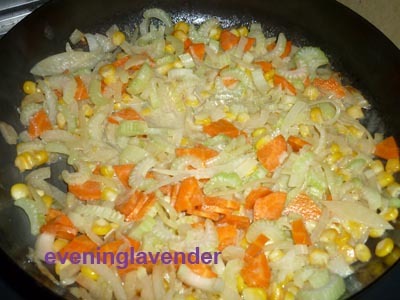 Stir in onion. When the onion is fragrant, add in all vege and stir. Add milk and cheese. Add salt and pepper. Mash the eggs and potatoes and add salad cream (remember only one tablespoon), pour in the sauce and stir. The salad is ready. It can be eaten warm or cold. 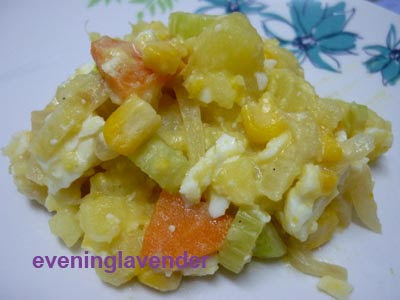 Hope you will try this easy and nutritious recipe.